See notes from Detective Derek 05/10: Tillandsia Uluru. From - DD0510 Tillandsia ‘Uluru’. This all started out at the May meeting of the Bromeliad Society of SA when Adam Bodzioch brought in a flowering Tillandsia. You see, he had been playing with chemicals to induce flowering. It had T. capitata ‘Domingensis’ hybrid on the label. It was all the more interesting because I had got a very similar looking plant from Nev Ryan in 2000 as hybrid #2000 that was still waiting to flower. Mine was from a seedling batch and the similarities of the seedlings suggest it was a primary cross. Clearly Nev was not sure of the identity of the plant he got the seed from when I got my seedling but later he was convinced the mother plant he had was one called ‘Domingensis’. Let us look at this rather obscure plant because this name is popular in collections. The name means coming from the Dominican Republic but there are other T. capitata growing on the island that used to be called Hispaniola which is now shared with Haiti. So the name is not really definitive in itself. In 1964 Ariza Julia collected a plant in the Dominican Republic at El Penon, Higuey to El Seibo, which Lyman Smith identified as T. capitata var capitata and is held as a herbarium specimen in the US National herbarium. A drawing was done and used by Lyman Smith in Flora Neotropica as an example of what this species should look like. This seems an odd choice when we know that this species comes in many shapes and sizes from both the West Indies and mainland Mexico. So botanically speaking it has been swallowed up under a broad concept species. From a horticultural point of view it does have certain identifying features and dare I say that the use of the name ‘Domingensis’ has much more meaning that ‘Yellow’, ‘Marron’, ‘Peach’ etc. The use of such terms based on colours is useless to anyone trying to make a study of this species! This small plant was recognised by nurserymen as being ‘different’ but as is usual nothing was done to define it. The fact that it was different meant it had a selling edge! In 1982 I brought back such a plant from the USA and no doubt, others over the years have imported this plant from the USA. In 1983 in Brom Soc 33(4): 170. Rauh & Ariza Julia wrote the following on a Tillandsia capitata var domingensis : “One of the most attractive tillandsias of the Dominican Republic is Tillandsia capitata, known only from one locality, the limestone rock called El Penon, between Higuey and El Seibo in the southeastern part of the island. 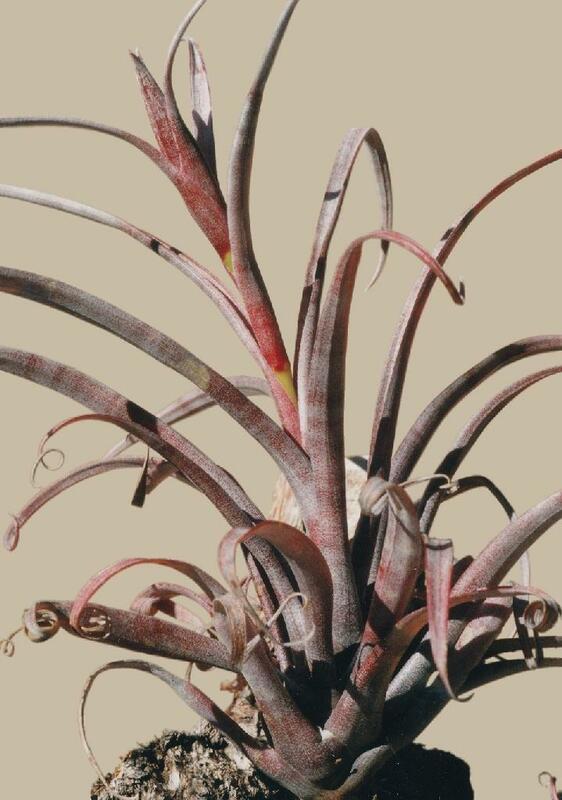 It differs in so many characters from the type that it should be described as a separate variety, T. capitata var. domingensis nov. var. Rauh et Ariza Julia, Fig. 19. But, nothing further was done – no Latin description, no herbarium specimen so it is an invalid name as far as taxonomists are concerned. We now return to the hybrid that occurred under Nev Ryan’s care but what provided the foreign pollen? Nev is not prepared to guess the pollen parent but I am putting my money on T. ionantha. In any event parent names, especially father, are only a guide. I’ll be getting the name ‘Uluru’ recorded. My plant is 18cm tall. This is an apt name because the plant is red and it just sits there for years doing nothing – just like a rock! If you have this plant I suggest you change the label.